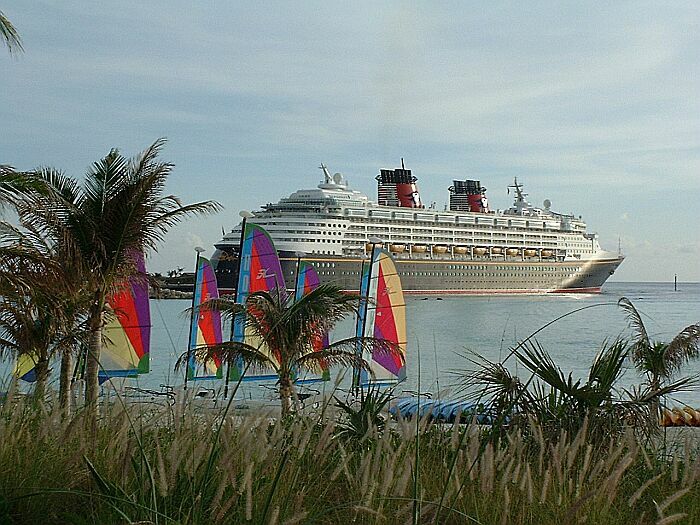 Castaway Cay day. I get up at 7.00am and Tam and I go up to deck 9 for breakfast at the Beach Blanket buffet. The ship has already docked and I eat my omelette while sitting and staring out over Castaway Cay. Its a beautiful sight and the white sands and turquoise seas are still as lovely as I remember them. At 8.30am we meet up with Mandy and Mark to disembark. Mandy has a 9.00am appointment for a cabana massage so we have to move quickly. We are first off the ship and first on the tram. We go past the spot on the family beach where we stayed last time we were here. I remember swinging in a hammock in a glade surrounded by palm trees. All this is gone, there are just a few trees and bushes left. The seasons hurricanes have certainly had an effect. We are the only people on the tram to Serenity Bay and grab a couple of hammocks and some sun beds as Mandy goes off for her massage. For an idyllic 30 minutes we have the beach absolutely to ourselves. Its perfectly quiet and stunningly beautiful. Me and Tam swing in a hammock for a while before Mark and I have a little paddle in the water. Its surprisingly cold on your feet when you first get in. This is quite a contrast to the warm water we experienced the last time we were here. 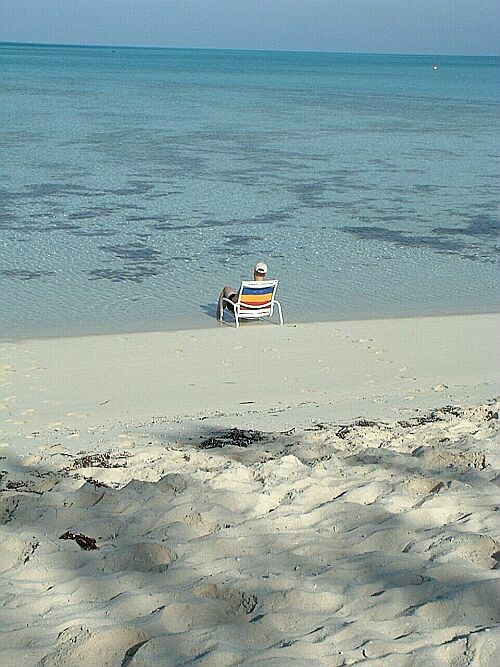 I grab a chair and carry it down to the waters edge and sit writing up my trip report with my feet in the water. I cant recall ever writing a report in more relaxing surroundings. Deb and Matt join us just before 10.00am and were all set for a day at the beach. Mandy returns in a relaxed state from her massage. There is talk of massage oils and lotions and Tam says to Mandy Ooh, Ill have to sniff you later, which is a bit of a disappointment to me, as I havent had a sniff all week. Its now 10.30am and Mark decides a drink is long overdue. The drinks waiter is called over and the order placed. 4 of us want Coronas and the waiter says you can have 6 bottles of beer in a bucket for the price of 5. Good deal! Matts ears perk up when he hears we are getting a bucket of beer, but is disappointed when he finds out it is not actually a bucket full of beer. Unfortunately this is the only Corona we manage to lay our hands on today, as they appear to have run out. Its not many people who can say that they have drunk Castaway Cay dry! The beer's ok, but what's the water doing there? A couple of hours of splashing and sunning follow before everyone goes for lunch except Tam and I who swing in the hammocks. When the others return Tam and I stroll up the beach to the hut where they serve the BBQ lunch. Its very nice, but the choice is not as great as I remember on the family beach. After lunch Tam and I stroll along the track, which runs at the back of the adult beach. It twists and turns for about a mile, but there is nothing much at the end of it. On the way back there is a rope across a small path, but no keep out signs. Being very naughty people we duck underneath the rope and along a short path to the beach. This is the farthest end of the adult beach and there are no sun beds or umbrellas and no one else about at all. The water here is crystal clear with no seaweed of any sort. We cant resist a swim and wade into the cool water. Its just wonderful, the sea gets deeper quicker than on the main part of the beach and at one point we have a dozen or so large fish swimming around us. Now this is close to paradise. Is it Ursula Andress? No, it's Tam with a large blue pancake. 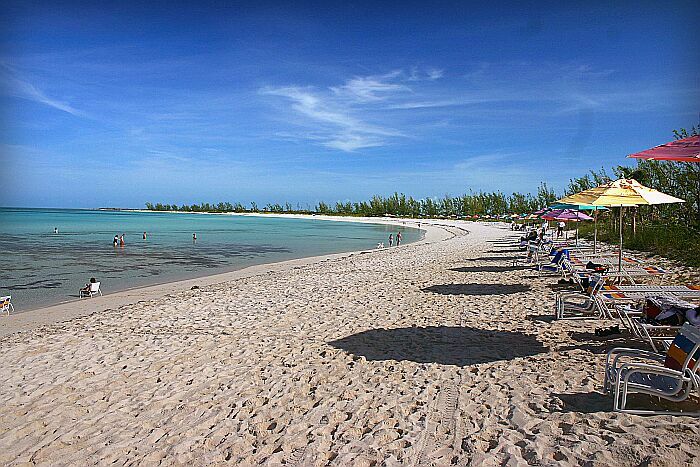 We take a slow walk back along the shoreline and reach the first of the chairs and sun beds. As we walk past, we look back at a small sign which says No entry please. Doh! Still, we are not the only ones as we see quite a few others strolling along there later in the day. I presume they try to limit the beach to a length that can be adequately supervised and served. The deeper water is probably a concern as well, which is a shame as it is so much nicer for swimming. The rest of the day is spent lying about in the beautiful sunshine (it must be in the 80s again today) interspersed with bouts of swimming. At one point Mark is in the water and shouts to us to come and have a look. We go to see a ray gliding past not 10 feet from the beach. Its a sizeable beast at about 2 feet across and serenely makes its way along the shoreline, ignoring the gawping humans. Around 4.00pm we make our way back to the ship. It has been a different experience for Tam and I spending all day at Serenity Bay (a very apt name) from the last time we were here when we spent the majority of our time on a very full family beach. 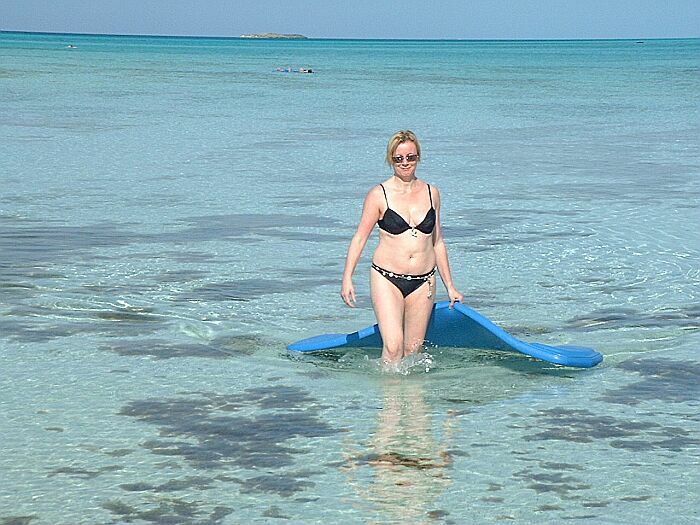 Castaway Cay is certainly a wonderful place and the adults only beach makes it just about perfect. After showers it is time to watch The Golden Mickeys. Im not sure this isnt somehow linked to David Beckham, as in he was grabbed by the Golden Mickeys. Tam and I arrive around 6.15pm and wait for the others. If you dont know this show, it is based around a Disney version of the Oscars. Out front of the theatre they have a rather glamorous lady interviewing stars as they arrive and this is shown live on the big screens in the theatre. A lady comes across and asks if we would like to be part of the show. We agree and are lined up for our interview. As we are waiting Deb, Matt, Mandy and Mark arrive. They watch and laugh at us as we are asked who we think will win the awards tonight and Tam is asked who designed her dress. Its just as well they didnt ask Matt to take part  some of the answers may have been a little too adult! Stunning. Simply stunning. And Tam looks ok too! The show itself is a distinct improvement on Hercules. As a Disney fan you have to love it and the interaction with Roy E. Disney is great. Off to the Cadillac Lounge to enjoy a couple of pre-dinner drinks and then on to Tritons. This is the nicest of the 3 main dining areas and Mandy points out the pastel blues and greens in the lighting that give the impression of being under the sea. As an appetizer, both Tam and I have the fried camembert, then we share the duck and the garlic crusted tenderloin for the main course. The tenderloin is particularly good and just melts in the mouth. For dessert I have the crème brulee, while Tam opts for the cherries jubilee. Most of us around the table agree that this is the best meal to date. The ladies decide they want to change after dinner, so we agree to meet up in the Cove Café as Mandy and Tam want to send e-mails back home. When Tam and I arrive at the café, Deb is missing. 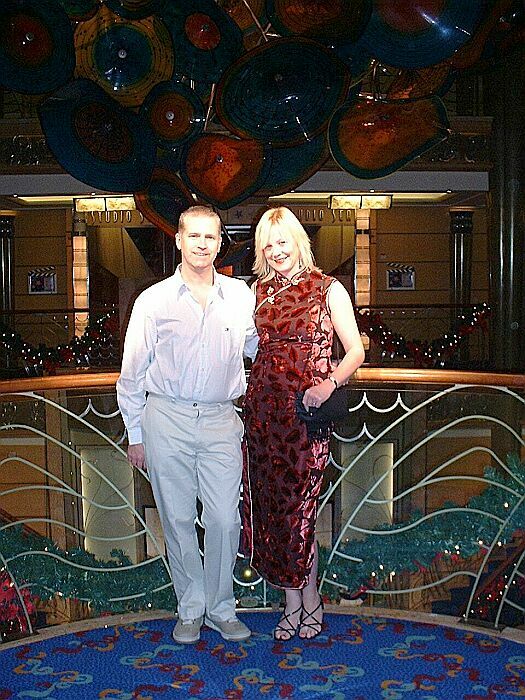 Matt says that she laid on the bed in the stateroom for a few minutes and fell fast asleep. The Cove Café is a new adults only area on deck 9. It specialises in coffees, liqueurs, spirits and cigars. Its a very warm and inviting space, nicely lit with comfortable seating. I have a beer and Matt has bourbon. E-mails are sent and then we sit at the tables outside when Matt pulls out his whopper. 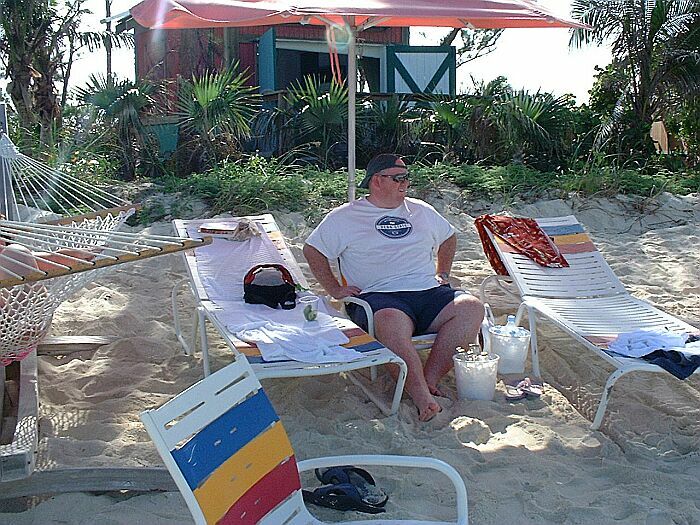 He bought a rather large Cuban cigar in Nassau and is now going to enjoy it. This thing is so big that, when sparked up, rivals the smoke coming from the Disney Wonder funnels. Its almost a 2 handed job just to smoke it. After their coffee, Mark and Mandy decide to retire for the evening. Tam is also nodding off, so we say goodnight to Matt and return to the stateroom around 11.30pm. Its been a lovely day. Peaceful and beautiful on Castaway Cay, good food and good friends to share the evening with. Lifes pretty good isnt it?